Welcome to Safe and Sound. We are a family owned business that has been around for over 20 years! Customer satisfaction is our number one priority. 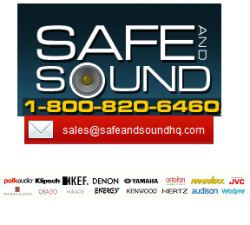 We are authorized dealers for EVERY product we sell. This means every item you buy from us comes brand new, factory sealed, with original, unblemished manufacturer's warranty. For 20 years we have established relationships with thousands of customers which we have developed a very strong reputation. When you place an order with us online, you can expect the same great service as our in-store customers. We are currently adding products to our website, so we encourage you to email us if you are looking for a product you currently do not see on our website. We look forward to having you as a future customer. Do I Need A Preamplifier for My Home Theater System? In - Wall Speakers Or Floor Standing Speakers?